I wasn’t planning on doing yet another “latest-issue-of-Daredevil revisited” post, and I certainly didn’t expect that the big fight scene issue that is Daredevil #25 would inspire me to. But it did, and that’s because Waid, Samnee et al. know how to do action right. Daredevil #25 isn’t just a series of panels of two players battling it out, but also full of valuable character insight. If you haven’t read the issue yet, stop reading now, go get your copy and join us when you’re done. Daredevil #25 can be seen as a straight – albeit highly compelling – fight comic. It can also be read as the riveting tale of a catastrophic error of judgment. This particular error is not that different from the ones we all make from time to time (though rarely with such dire consequences) and helps cement Matt Murdock as that oh-so-human character we all know and love. It’s also a type of error that seems like a highly logical byproduct of how Matt functions in everyday life. While we commonly see him excel in situations that provide him with all the information he needs – and then some – it is not difficult to imagine that making educated guesses or elaborate inferences about things is a skill he’s had to hone to the very limits of human capacity. We get to see this process at work in the first half of this issue. When Ikari enters the scene wearing Jack Murdock’s old boxing robe, this presents the reader with a fairly striking image. Not being able to see the colors of the robe or read the name printed on the back, Matt doesn’t get that instantaneous spark of recognition, but he is able to piece it together nonetheless. He can smell his father’s old shaving cream and is able to determine (probably by the sound of the fabric moving) that it is made of silk. Half a lifetime of perfecting the art of weighing the evidence (a skill that law school and his career as a lawyer would have helped sharpen further) has made Matt Murdock quite confident in these abilities. When you add in the fact that he may not always have the time to consider other options, it is easy to see why his go-to strategy is to gather as much information as possible, quickly run as his own analysis of what exactly he’s dealing with and then commit one hundred percent to a plan of action. Based on the information he’s gathered from his encounters with the earlier test subjects of this experiment (vagrants and dogs) and with the confidence gained from spotting the trap to begin with, he comes up with a strategy that he never thinks to question. His confidence is shared by the readers. Because while we are all familiar with Matt’s long list of personal defeats, he is someone who inspires trust when it comes to doing what he does best. If it were not for that one variable he hadn’t considered, the plan would have worked. Because as he strings us along as the narrator of his own demise, Matt also reminds the reader why being him isn’t as easy as it looks. That he is, in effect, much more than the sum of his powers and that no man can hope to imitate him without going through the grueling training he suffered under Stick’s tutelage (and I do think “suffer” is the appropriate word here), and years of trial and error. He bets everything he has on this one advantage, the one he earned through hard work and dedication, not simply by the magic of taking a face full of toxic chemicals. By making things as difficult as possible for himself, counting on the years of experience to drive a wedge between himself and his opponent, he inadvertently sets his own trap. The moment of realization of what he’s done is an instant classic and “Try the red one.” is a brilliant line. This is the moment when his false optimism is shattered and his one big plan falls apart. It is really quite an interesting turning point in the overarching story Waid has been building up to since his very first issue, and I’m intrigued to see what this massive defeat will do to Matt in the next issue. His body has been beaten to a pulp, but it’s his ego that has likely suffered the biggest blow. Will Matt start to feel the fear and doubt get the best of him? I don’t know about you, but I will just come out and say it: I don’t have a clue who the big mastermind is. Certain things still point to Bullseye (someone “whose hate for you keeps him alive” and “knows how to stab your heart”), but the overall modus operandi suggests someone with 1) more money, 2) more scientific know-how, and 3) better people skills. The use of the yellow costume also threw me for a loop, as did the use of “Mister Murdock” rather than Daredevil in certain places. This, to me, suggests someone who may have more of an axe to grind with Matt Murdock than with his costumed alter ego. Heck, maybe it’s the long awaited return of Paxton Page who is looking to avenge the death of his daughter. True, he appeared to die back in Daredevil #57 (vol 1), but this is comics, after all. Mark Waid talked Daredevil, Indestructible Hulk and a Hank Pym one-shot as part of Friday’s Axel-in-Charge interview with CBR. Will these elements from the Daredevil comic make it into Netflix’s third season? I can’t quite put my finger on it yet, but for some reason this issue left me feeling a little blah. It’s the first time in this run I felt like an issue was simply marking time, even though the battle with Ikari was rather lengthy. I hope there’ll be a huge payoff next issue. Something to ponder in terms of the identity of the mystery villain: why was Stick so prominently featured in this issue? For me, one of the finest single issues I’ve read in a long time. It wasn’t the action, but the drama. The build-up, the flashbacks, the fantastically cruel twist. Delicious. Good, solid, beautiful comics. None the wiser as to the identity of Matt’s adversary, mind. If it’s Paxton Page, then who is the woman helping him? It ain’t Karen. At least, I hope it isn’t. I still think it’s Deathstalker and the new (lady) Deathstalker helping him. Unless it were Paxton Page AND the new Deathstalker, assisting him. That would be crazy! I’m willing to bet that the big mastermind is Mister Fear. 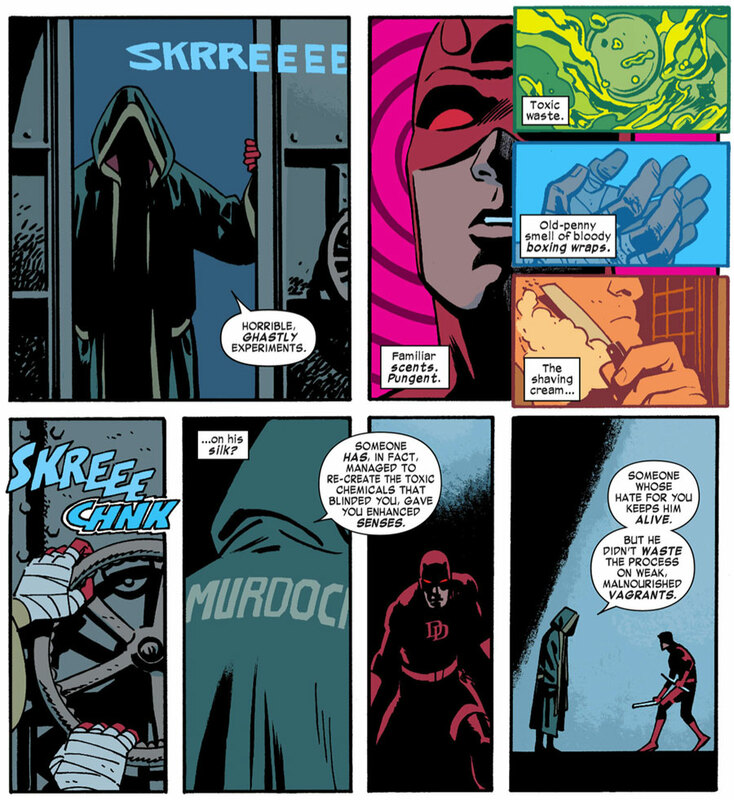 During the Brubaker arc, he did have a big hatred for Matt Murdock. The name “Larry” is dropped by Ikaru. I’m guessing that’s for Larry Cranston a.k.a. Mr Fear. I’m not sure, but I think they both knew each others in college, (abd they worked together according to wikipedia). So the fact that they say “Mr Murdock” also makes sense. And we’ve also seen Milla recently. It could be a subtile way for Waid to remind us of what this bad guy did to her. I caught the “Larry” name drop too, and also mentioned in the review post how Ikari telling Matt that his master alone knows how to FRIGHTEN him could be a possible allusion to Mister Fear. But I think that this is all just Mark Waid throwing out a couple of red-herrings. After all, the last time we saw Mister Fear he was living the good life, albeit in prison, with both inmates and gaurds practically worshipping him. He had his win over Matt. There’s no need to come after him again. I think at this stage it has to be Death-Stalker. Because aside from the clues which I pointed out last month, only he would really have both the brains AND the resources needed to orchestrate the machinations which have plagued Matt since he returned to New York. Either way, as Daredevil fans it’s great that we’ve got such mystery like this to ponder over. Actually makes me wonder what else Waid has got planned for Matt once this storyline wraps up. Larry is the name of the guy who shows up at the beginning. Though why Waid chose to name him that is another question. It was great reading here how Matt forms his plans of attack, how he reacts and thinks, how he uses his advantages and knowledge of his own personal weaknesses to try and overcome this new adversary only to have it all ripped away as he realizes he was completely wrong about the nature of the situation and fight. The only serious clue I saw was the comment about fear in the last panel which does make me think of Mr. Fear. It may be that simple…..it may not be. All I know is that I can’t wait to see who Waid serves up as the mastermind.